At least five people were killed and dozens others injured as a dust storm lashed Pakistan's southern port city of Karachi from Sunday to Monday, local reports said. 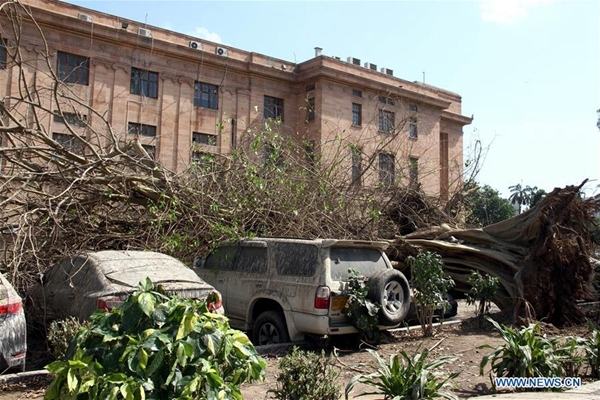 The dust storm, which hit the city on Sunday night and continued till Monday, damaged several houses, uprooted trees and signboards besides collapsing walls of schools and houses, Dawn News said. In one such incident, seven kids were injured when their school wall collapsed due to gusty winds. The children were shifted to a hospital where three of them are said to be in critical condition. Seemi Jamali, medical superintendent of Jinnah hospital Karachi, told media that they received 37 people suffering injuries of different natures at their hospital since Sunday night. She said that one of the injured was dead at the hospital whose body was handed over to his relatives. Four people were killed in roof collapse incidents and road accidents when vehicles or motorbikes were flipped over due to dust storms that reduced visibility to 2 meters in various areas. According to local media reports, six vehicles including a police van and five passenger vans had accidents due to the dust storm. Samaa News said that a fishing boat carrying 10 local fishermen went missing in the Arabian Sea due to strong winds. Pakistan Navy boats initiated a search operation in the sea to rescue the missing people. Local media reports said flight operation at Karachi airport was also disrupted. Electricity supply was suspended in various areas, as power transmission cables got damaged due to windstorm. Officials from Pakistan Meteorological Department said earlier last week that dust storms and torrential rains are common phenomenon in April as winds coming from low temperature western areas cause weather disturbance in the form of hailstorm or dust storm in Pakistan when they get mixed with high temperatures here. The weather officials said the current west wave will recede on Monday evening, and the weather condition will go back to normal.